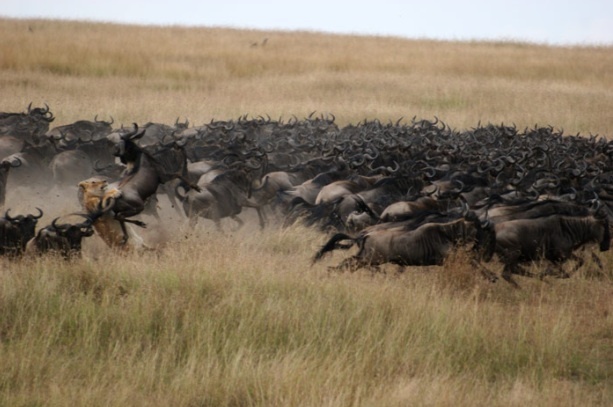 Last week camps and lodges throughout the Maasai Mara in Kenya reported that the wildebeest migration had arrived. In honor of the arrival of the migration here is some information on the migration and few tips that will leave you perfectly positioned to see it. When and Where Does the Migration Happen? Between December and April the wildebeest are on the short grass plains in the Ndutu area in the southern Serengeti but depending on the local rainfall they might in a much wider area between Ndutu and the Ngorongoro Conservation Area (just southeast of Serengeti National Park but not inside Ngorongoro Crater itself). During this time, typically in February, wildebeest mothers give birth to more than 500,000 calves in a 2-3 week period. Within 10 minutes of birth wildebeest calves are on their feet. In April and May, the rains stop and the plains in the south and east of the Serengti dry out. This shift causes the herds start to moving to the north and west where there is more grass and more dependable water. During this period not all the wildebeest and zebra follow the same route some travel further west than others who head northwest. This means that, part of the Migration will head to the Western Corridor and the Grumeti River before proceeding north and large numbers may also go up through the Loliondo area or through the Seronera area and into Lobo. June to July is a transitional period between the rains and the dry season. As they concentrate on the few remaining green patches of savannah, the huge herds reform and push further north towards the Maasai Mara. Between July and August the wildebeest move into Kenya's Maasai Mara crossing the Mara River in large numbers. It is these crossings that generate some of the iconic images of the migration but catching a river crossing in action is a challenge. The area where the crossings occur is vast, even traveling by car and even if you find a group of animals at the edge of the water they are cautious (and stupid) and may not cross for an hour or a day because of real or imagine threats. Although rare and elusive, if you are lucky enough to catch a river crossing its guaranteed to be the unforgettable experiences as a herd which has stood at the water's edge suddenly crosses in a panicked mass, struggling to get to the other side of a crocodile filled river. As with the other stages of the migration the exact timing of the crossing into the Mara is hard to predict and depends on the rains. In a dry year, the ﬁrst wildebeest could be near the Mara River in early July; in a wet year, by mid-August. If there is plenty of grass and water, the herds may be spread out all the way from Seronera to the Mara River. In addition it is often the case that the whole Migration may not move into Kenya. Many animals remain in the Northern Serengeti or cross and re-cross the Mara and the border between Kenya and Tanzania several times following periodic rain showers. This carries on until October/November when the animals in Kenya begin moving back into the Northern Serengeti. 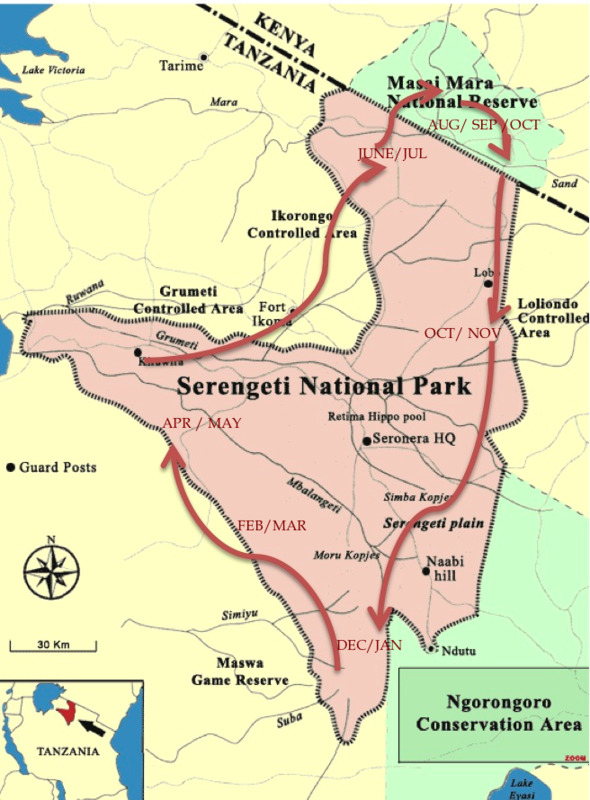 Between November and December many will move south within the Serengeti to the breeding and calving grounds where they spend December through March. It is important to remember that the whole migration is millions of animals and is never in one place at one time, they cover a huge area. As a traveler you can be in a region where the migration has supposedly passed or has yet to arrive and still see thousands of animals. I have seen thousands of wildebeest in the Southern Part of the Serengeti in January. World class safari guide Richard Knocker puts it best when he says "the Migration is not a continuously forward motion. They go forward, backwards, and to the sides, they mill around, they split up, they join forces again, they walk in a line, the spread out, or they hang around together. You can never predict with certainty where they will be; the best you can do is suggest likely timing based on past experience, but you can never guarantee the Migration one hundred percent." Given all this complexity, here are recommendations that will give you a great chance to see the migration. These recommendations reflect where wildebeest tend to be at a given time of year and although they are based on years of experience they are estimates! Nature doesn't stick to our schedule! There are lots of wonderful safari camps in Tanzania and Kenya for migration viewing, these are just a few great ones in each area the migration moves through throughout the year. Mid-July through September/October: The list is quite long here but some of my favorite camp for the beginning of the season are Serian Camp, Elephant Pepper Camp, Mara Plains, Rekero, Offbeat Mara and Kicheche. By September and October I would recommend Sala Camp, Cottar's Camp and Naibor. October and November: Klein's Camp, Migration Camp and all the mobile camps. Because the migration can vary from year to year mobile camps are a great way to make sure you are perfectly situated. These camps move every 3-4 months, moving north within Tanzania to follow the migration. The locations for all the mobile camps are similar so what really sets them apart is the level of accommodation. Here are 4 mobile camps in Tanzania (in order of luxury): Serian Serengeti North, Serengeti Under Canvas, Olakira Camp and Nomads Serengeti Safari Camp. Serian also has a mobile camp, Nkorombo, in the Maasai Mara in Kenya. Most properties in Kenya have low season starting in October and this makes it a great time to catch the end of migration as the wildebeest cross the Mara River back into Tanzania and can be great value for money. Many properties drop as much as 20% per person per night between September and October.